Swift Optical's M10L Series LCD Digital Compound Microscope is an advanced scientific tool that's as useful in a college or university biology department as it is on the quality control and testing line of a food processing plant or any manufacturing facility. Hazmat units will find this microscope perfect for examining specimens for contamination and veterinary hospitals will be able to easily show results to pet owners on the built-in LCD display. 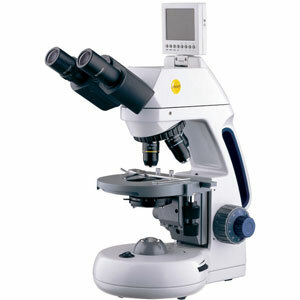 In fact, the M10L offers unlimited microscopy possibilities. The illumination system in the M10L is a corded, variable intensity, 3W LED identical to those found in professional and medical microscopes. Objective options include Semi-plan, Plan and Phase. Motic Images Plus software and calibration slides are included. This microscope is also available in a monocular version, which would prove especially useful in a classroom setting for young children.